Summer Poetry — Ginger writes. I have been thinking this week about what makes summer summer, and what we can do or not do to make time feel slow. I have five ideas so far. 1. Sit on the floor in the corner of Story's bedroom and read books to the girls. They each pick a book and I pick a book. Cash, if he wants to join us, picks a book too. Repeat multiple times throughout the day as needed to keep time moving slow. 2. Play Bingo with the kids. The simplicity and slowness of this game works a miracle on everyone who plays. 4. Read a book of my own during daytime hours. Fifteen minutes will do the trick. An hour would be a luxury and isn't required. When I give myself permission to sit and read for a few minutes, just because I like to read, I feel slow and steady in my life. 5. Learn poetry with the kids and take time several days of the week to practice old and new lines. The rhythm of poetry, the wisdom of the words, the soothing sounds, the novel ideas, the time it takes to listen to one another, the exposure to beauty, the joy in recitation, the blending of voices: these are the whys. Hows don't matter, but if you need a place to start, how about these poems? 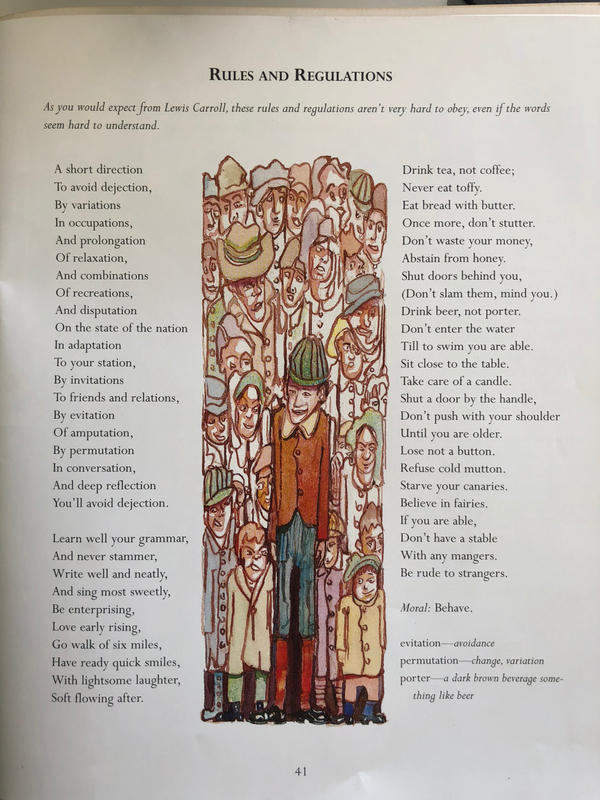 Last summer, the boys and I learned Alice Carey's poem "Nobility." This summer, I wanted each of the kids to have their own poems to memorize (I am learning Bauer's too). My friend Gretchen, who is a lover of literature as well as a middle school educator in Texas, was a helpful resource to me, providing a list of quality poems I could curate. Bauer is learning three poems from Gretchen's list, plus a famous section of one of Elizabeth Barrett Browning's pieces. 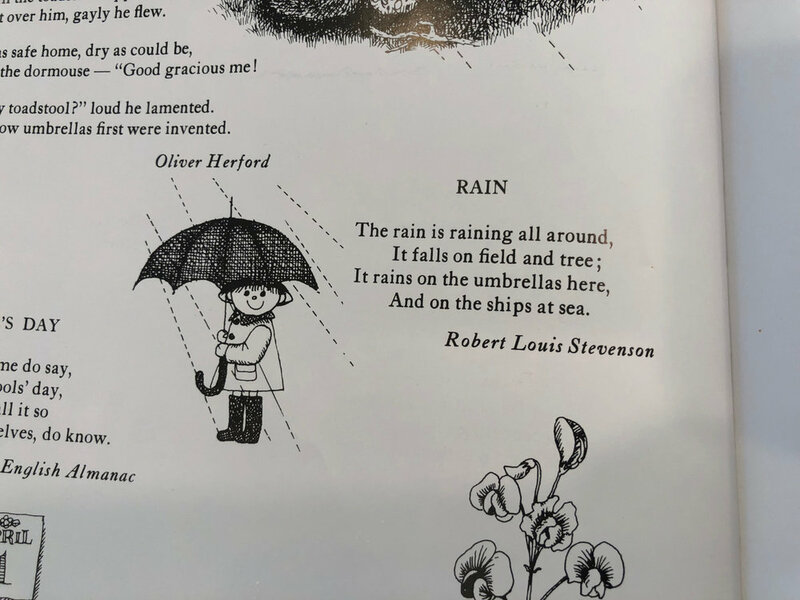 Cash chose a poem from the Lewis Carroll book that his third grade class used this past school year. Toward the end of school, his teacher gave the assignment to choose a favorite Lewis Carroll poem to read to a family member. Without hesitation, Cash picked "Rules and Regulations," so when it came time to settle on a poem to memorize, it only took a tiny bit of encouragement from me for Cash to make this his summer selection. He's more than halfway done and is having fun. Story's class learned two A.A. Milne poems, "Daffodowndilly" and "Wind on the Hill," as part of the class memory work in first grade. At home, she had previously memorized three other Milne poems: "Vespers," "Puppy and I," and "Before Tea." The little stories that Milne's poems tell are delightful and relatable, so I knew I wanted Story to continue with his poetry for summer. So far she has learned "The Christening." I haven't decided which poem will be next. Sailor has mastered her first poem ever. She knows bits and pieces of lots of the poems and Scriptures the kids have been reciting in her presence ever since she was born. But never before now have I chosen a piece specifically for her. She is the cutest, proudest little thing, even though she will barely speak above a whisper when she recites for us. I didn't mean to pick a weather theme, but "Rain" was first, and "Clouds" will be next, both to be learned during the sunny days of summer. We are also memorizing part of John 15 that I wanted to learn together with the kids this summer. I think the reason I want to learn lines all the time is that they make me feel better. Not in the sense of being better than others because I memorize stuff and get my kids to do it too, but in the sense of feeling more whole and more alive. Saying the lines over time helps me make sense of life in its variations, points me to truths to stand on, and perhaps best of all, inspires me to live my days, summer or otherwise, more fully and more slowly. Even nonsensical poems like "Rules and Regulations" have something to offer, maybe the lesson that things can sometimes just be for fun. Not everything has to be figured out or useful or on schedule or for money. It is the silly ones who hurry and lose time on the way. So maybe this summer, you could learn to lick a popsicle; don't bite it. Learn to read in the daytime. Learn to sit on the floor for Bingo and reading corner. Learn to call a friend; don't always text. Learn to write a letter, slowly like your hand writes. Learn to listen to birds and to your kids tell stories about birds. Learn all the words to a song. Learn a poem. Learn that nothing gold can stay, so learn to love it while you can.